Over the past two years, the three researchers on the recently concluded Leverhulme Trust research project on the Lady’s Magazine at the University of Kent have studied and uncovered a previously inaccessible periodical archive of late-eighteenth-century and Romantic-era print culture. 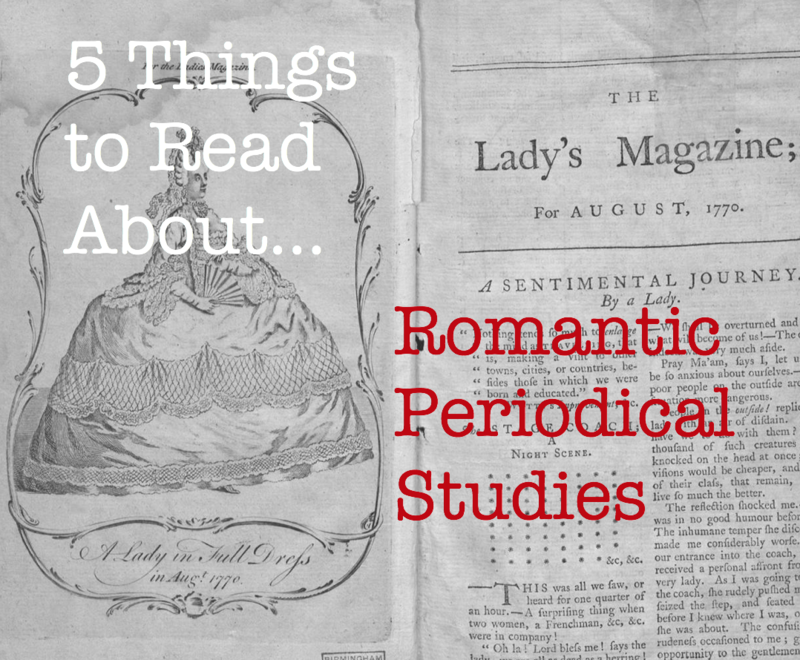 In this list, they suggest five resources that may be of use to researchers who are first venturing into Romantic periodical studies, including a few that may be worth a second look even to more seasoned scholars. In the few years since its publication, this one-volume encyclopaedic work has become a frequent reference in periodical studies. So far this is mainly the case in scholarship on the Victorian period where periodicals are more commonly studied, but the DNCJ is just as valuable to researchers working on the Romantic era. Despite what its title may suggest, it covers not only the genre of ‘journalism’ in the strictest sense, but every aspect of periodical print culture in the British Isles during the long nineteenth century. Its 1,620 entries are devoted to a wide range of publications (magazines, newspapers, review quarterlies, miscellanies), people (writers, editors, publishers, printers, illustrators, etc.) and topics (e. g. the Chartist press, censorship and trials, science popularization, taxes on knowledge), making this an ideal source to consult early on in a research project. It also contains a vast bibliography that lists the most important scholarship relevant to every entry. Besides in print, the DNCJ is also available online through the Nineteenth Century Index (C19) portal hosted by ProQuest, where it is updated regularly with new entries. Mayo’s ground-breaking study of short and serialized fiction in periodicals (despite the title not just magazines but also essay serials and miscellanies) is a classic text in long-eighteenth-century British literary studies. He wrote it because ‘[p]reviously, historians of the novel [had] written as if the stream of prose fiction that flows between Pamela and Waverley were fully reflected in the publishers’ lists and registers of new books’ (p. 1), and corrected this too restricted view singlehandedly by demonstrating that periodicals dwarfed books as a popular site of literary publication. The generous appendices in this book, including a 200 pages and 1375 entries long annotated ‘Catalogue of magazine novels and novelettes 1740-1815’ that appeared across 238 periodicals, make it as much a useful reference work as a highly informative monograph on the subject. Although this book covers a far longer period, the 1790s and early nineteenth century are amply represented, and while its humbling survey of periodical fiction is inevitably incomplete, it has been supplemented but arguably never surpassed. Although twenty years is a long time in scholarship and some of its claims have since been adjusted by later scholars (see below), Klancher’s study is still cited frequently in scholarship on Romantic-era print culture. He demonstrates throughout this book that the strategies of periodicals (with an emphasis on magazines) to establish an audience for themselves, mostly along the lines of ideological and class affiliations, influenced the consolidation of new social profiles during this socio- economically turbulent period in British history. Defining periodicals as to their targeted readership, Klancher delivers a lucid overview of the periodical market during the Romantic era. This book also offers sobering lessons on the overlap of commercial, political and aesthetic concerns in the early nineteenth century that provide necessary nuances to the high-wrought rhetoric of the Romantic periodicalists themselves, such as on the contemporaneous cult of Genius. Print culture is best understood as one big, often hostile and usually bewildering conversation, and this book can help you to figure out where a particular author or periodical is to be situated in the distinctly partisan press of the day. David Stewart, Romantic Magazines and Metropolitan Literary Culture. Basingstoke and New York: Palgrave Macmillan, 2011. This book focuses on the complex yet mutually reinforcing relationship between the magazine and metropolitan, commercial culture between 1815 and 1825. It places the magazine, as it undoubtedly was, front and centre of debates about reading, commerce and, most importantly, the literary, demonstrating how these years witnessed the emergence of a new canon of magazines ‘distinguished by … their literary status’ (p. 5). The book gravitates towards to the more self-consciously literary magazines of the period, Blackwood’s especially, but less well-known periodicals and writers also feature as part of Stewart’s account of the wider ‘magazine culture’ he argues is distinctive to this period. It is a culture, Stewart claims, that offers a rather different picture of the English reading audience than that presented in Jon Klancher’s earlier and rightly influential monograph listed above (although their accounts can be read together). Rather than seeing in the Romantic magazine evidence of the ‘discontinuity of publics’ identified by Klancher as characteristic of periodical readerships from the 1790s onwards, Stewart contends that magazines demonstrate their ‘relationship with a market which united all shades of opinion in mutual juxtaposition’ (p. 8). Our index is intended to be a complete research guide to the First Series of the Lady’s Magazine (1770-1818), the most popular and enduring monthly periodical for women of the long eighteenth century. The magazine ran for 13 issues of 50 to 60 twin-columned pages every year for many decades. Working with such a vast archive is logistically challenging even in the digital age. Titles in the magazine are often profoundly misleading, the magazine’s own editors often mistakenly paginated items and OCR is not always reliable. Our index helps readers navigate these and many other issues besides and provides a wealth of information on authors and sources not present in the magazine itself. The index is available in the form of a freely downloadable Excel spreadsheet, and can be consulted online (also on open access) as part of Adam Matthew Digital’s Eighteenth-Century Journals website. ‘The Lady’s Magazine (1770-1818): Understanding the Emergence of a Genre’ was a two-year project funded by the Leverhulme Trust Research Project Grant scheme. The project team was based at the University of Kent and was led by Professor Jennie Batchelor, who worked alongside the project’s two full-time Postdoctoral Researchers: Dr Jenny DiPlacidi (now Lecturer in Eighteenth-Century Studies at Kent) and Dr Koenraad Claes (now Postdoctoral Fellow with the Research Foundation Flanders at Ghent University – Belgium). Its aim was to shed new light on one of the first and longest running monthly women’s magazines. In an 1840 letter to Hartley Coleridge, Charlotte Brontë wrote that she wished ‘with all [her] heart’ that she ‘had been born in time to contribute to the Lady’s magazine’. 170 years later the publishing history and cultural and literary importance of a title, much of the original content of which was produced by unpaid reader-contributors who helped to generate 13 issues of content per annum for an astonishing 62 years remained undocumented. If you would like to contribute to ‘5 Things’ please contact series editor Dr Sarah Sharp (University of Otago) at sarah.sharp@otago.ac.nz.